A new Rhythmbox 0.13.0 (git) version was uploaded to Ubuntu 10.10 Maverick Meerkat almost 2 weeks ago, but we didn't update our Ubuntu Lucid Rhythmbox PPA to this new version because it failed to start most of the times. The weird part is it didn't crash for me but only when trying it on a fresh Ubuntu install (in VirtualBox). 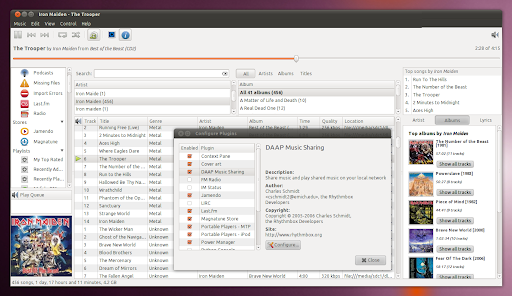 But today, some patches have been added to the Ubuntu 10.10 Rhythmbox version and it should finally work in Lucid again. So we've uploaded the new Rhythmbox packages to our Ubuntu Lucid Rhythmbox PPA. This new version finally brings the DAAP plugin back and it also includes all the Maverick fixes. However, I do have some bad news for the Lucid users who have been using our Rhythmbox PPA: the appindicator patch has been removed from Maverick and although I was able to update the patch, Rhythmbox fails to compile with this patch. I will continue to try and get it to work but I can't promise anything so (if) until I get that to work, you won't get an appindicator for Rhythmbox, but only a notification area icon (I've enabled it by default but you can disable it via the Plugins preferences in Rhythmbox) - that's the default Rhythmbox notification area icon in all distros except Ubuntu (and Ubuntu until Lucid). Along with Rhythmbox 0.13.0git, I've also backported the latest UbuntuOne Music Store and Radio Browser plugins to Lucid. However, only after I've uploaded these packages I saw that the UbuntuOne Music Store plugin doesn't even work in Maverick. So to use it, you must wait for a new version (sorry - this does not depend on my packaging!). That will remove the PPA and downgrade all the packages to the versions in the official Ubuntu repositories. As always, report any bugs you may find on Launchpad, as there's nothing I can do about it.